The band saw is an amazing tool, or so I am told. I must admit that with my Craftsman 12 inch saw (similar if not the same as the Rikon with 8 inch resaw) that I was not always feeling the thrill. Part of this may have been the fact that I tended to use a compromise blade to avoid changing between resawing and scrolling optimization. I don’t have the patience for band saw blade changes and the subsequent tuning. The path of least resistance from my perspective was to get a saw optimized for resaw. Enter the Laguna 14-12. The Laguna 14-12 is a value oriented saw in the 14 inch market. There certainly are saws half the price and those 2-3 times the price. FWW named it a best value and it is typically available for ~$1,000. You can add a light for $100 (probably not worth it if you ask me since it is oddly placed and pretty expensive) and a mobile kit for $150 (If you need mobility probably a good choice and I feel it works well). Assembly of the saw was straightforward and the directions are adequate. It is heavy. Get a friend or two. The fit and finish of all the metal is top notch. It absolutely amazed me what a beautifully built saw one can get for this price. The doors, the 10-points of support for the blade with ceramic guides, and the height adjustment scream quality. The table is nicely polished and the two position (high/low) fence stupendous. Sounds like 5 stars right? Well the aluminum insert needed to be filed down to fit easily in the table. Once adjusted it is fantastic (and great dust collection). So why then when I turned it on was the vibration so horrible? The answer is related to the same factors that allow such a saw to be produced with generally excellent quality at such a low price: outsourcing. The problem turned out to be the tires (I actually did not realize it could be such a big deal when the tires basically looked fine). Laguna suggested the source of the problem and believed their supplier was having manufacturing troubles. They sent out another one. After realizing these things were poor quality and not so easy to put on I went to a third party (Sulfur Grove Tool, very helpful and highly recommended based on my single interaction with them). Problem solved…a month later. Performance has been assessed with test cuts (3/4 inch Timber Wolf blade) of pine 2×4 with fence and some really gnarly cherry free hand. A few more cuts were made to look at curves. I finally understand why people believe the band saw is an amazing tool. For the price, and perhaps at any price, this is an amazing piece of machinery brought to us courtesy of a globalized economy. I got this saw recently and have nearly the same reaction. I think it’s a fabulous tool, and I’m surprised at the couple of problems I had, even when they were easy to fix. In my case, I had a belt squeal (easy fix, loosen the nuts, press down on the motor while tightening them back up), and an ill fitting insert. I got them to send me another insert, which had the same problem (fits the “far” side, not the “near side”). The solution for me was simple. The part that doesn’t fit has the blade exit cut in it. I stuck in in my vise and closed it a bit. Fits fine now. I had a small problem getting to talk to Laguna service. I called the number listed in the book, reached an operator who always transferred me to someone’s email. After a couple hours and 3 tries, I emailed them. Got a call back within the hour from a very knowledgeable, very helpful tech who was mistified why the earlier attempts to call hadn’t resulted in a call back. He walked me through the belt squeal fix and sent out the insert. But I did a bunch of resawing on it, and it works GREAT. The saw is also gorgeous. Usually, free blades are useless. Great review. The saw does not come with a blade. I bought an generic 1/4” 6 tpi for general use and a Woodslicer 3/4” for reswawing. I had a chance to use my saw for the first time in a month today (its been cooold in my shop) and it reminded me how great this saw runs. I have the 5/8” Shearforce blade on it and makes super smooth cuts in hardwood. I love mine realy a fantastic tool. I also bought this same saw recently (12/2014). I decided to build a mobile base for it before I even took it out of the box. The saw’s stock table height of 38”, felt a little low to me (I’m 6’4”) and I wanted to get it up closer to my waist. The table height is now 44” and feels much better to me. This is my first bandsaw, so I don’t have prior BS experience to compare it against. Compared to my other tools this is very high quality—as the others have stated. I too experienced the ill fitting insert. My insert fits the opening, but it is tight. I think I could do a little filing, but I don’t mind the snug fit. I don’t really notice annoying vibration or noise while operating the saw, but one time I found that if the locking nut on the table tilt bolt—the one closest to the spine of the saw—is loose, then I get some noise and vibration. I find that if I press down on that back edge of table while tightening the trunion locks, that I get much less noise and vibration. My fence was not perfectly square to the table. I shimmed with painter’s tape until it was very close. I sorta wish the trunion knobs/locks were round. I think it might be easier to remove and adjust the table—although the knobs on the table are nice and work just fine. I wish the saw had a small brake—maybe something near the on/off switch that I could push with my hand. I’ve been using a 1/4” and 1/2” blade (Timberwolf 3-4 tpi blades). Both of these cut very well. Interesting note, I only had to tension the 1/2” blade to the middle of the 3/8” tension scale in order to get rid of “flutter”. Does anyone with the Timberwolf blades find that they need less tension than the bandsaw tension scale would indicate? I also bought a 1/2” Woodslicer which I have not yet tried. I did not buy the light or the mobile kit (obviously). I use a magnetic light. All in all I like the saw and have no regrets with the purchase. UPDATE: I noticed the other day that the fence that came with my saw was not flat. I know it has those flat ridges and valleys—but on my fence if I lay a straight edge across the fence (height dimension) the center “ridge” is slightly higher than all the other ridges. I called Laguna—explained the situation—they decided to ship me another fence—got it a few days later. Good customer service! Chem: thanks so much for this review. 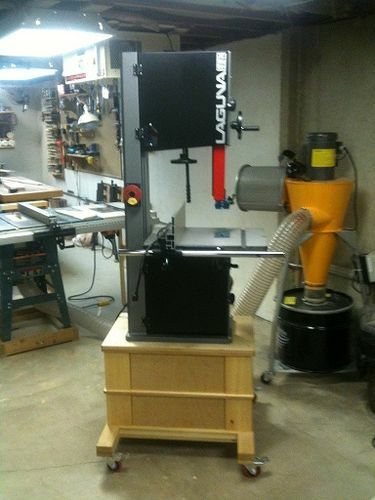 I am just now starting to look at a replacement for my Craftsman 22400 12 inch bandsaw, and I am seriously considering this Laguna 14 Twelve. Bill_Steele: I am also considering mounting the 1412 to a cabinet stand that I made for my Craftsman saw. Can you tell me how tall your stand is (from the floor to the mounting base of the saw). Then I can figure out how high the table will be if I mount it to my cabinet. Thank you! HuskerHardwood—my mobile base is 23-1/4” tall (from floor to top) which puts the bandsaw table at 43-3/4” from the floor. Bill_Steele: Thank you for the quick reply and information! I am getting close to placing an order for one of these saws. I am also glad to see that you are not having vibration issues, as I read several reviews that talked about replacing the original tires with aftermarket versions. HuskerHardwood: No problems experienced yet. This is my first bandsaw so I’m not sure how this one comapres to other saws. For a frame of reference, I’m able to balance a nickel on it’s edge on the saw table while the saw is running (1/2” blade). There is some small vibration. My mobile base is also heavy. I made it about 125-140 pounds. The lower section has concrete pavers in it to add ballast. Perhaps this helps absorb some vibration? My thought was that a heavy base would make it less “tippy”. I’m very happy with how it turned out. I have noticed that the tires are not uniform all the way around the wheel. There are some small gaps on the sides, but this does not seem to affect the tracking or how the blade rides on the tire. I do not plan to replace them. I did find that the fence was not flat (in addition to not being square to the table). I contacted Laguna and they sent me a new fence (just the aluminum part). The new fence is flat and after shimming the bottom a little with painters tape—it’s also square to the table. The saw cuts effortlessly. It’s a joy to use. It feels solid and of high quality. I don’t regret the purchase one bit. HuskerHardwood. Not so fast on replacing that Craftsman 22400! You really need both (these are two of my three bandsaws). You are much more likely to use the appropriate blade and have it well set up when you don’t need to change blades. Also I found out I could not fit a Carter circle cutting jig on the Laguna (the table is huge which is nice, but it extends too close to the column to allow the jig to clamp). The jig works flawlessly on the Craftsman 22400 and benefits from having a narrower blade. Yeah, my problem is space. I have a garage based workshop, so most all of my power tools are on wheels so I can move them out away from the wall for use. 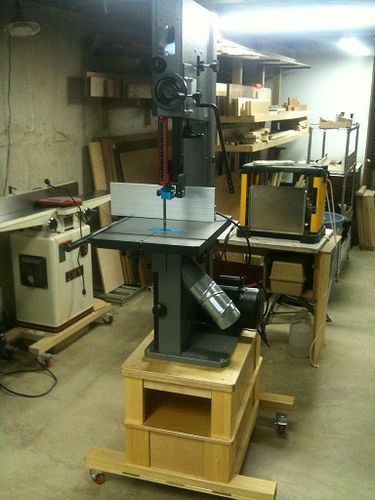 Unfortunately, all of my space is used up, so I don’t see a way to keep the old bandsaw. Plus, it helps my case with the wife if I can at least get a little money back by selling the old one! Can I also ask what people would recommend for blades for this saw (size and brand name)? I would like to start out with one for general purpose work (cutting curves in up to 3/4 inch thick wood), and another one dedicated for re-sawing. I appreciate everyone’s inputs on these forums. I have learned a lot just looking through them. I got a 3/4” Wood Slicer and a 1/4” 6 tpi generic blade from Highland for my 14-12.